So the AFP has been using this before? A US Navy solicitation has shown the Philippines to be a hitherto-unknown operator of the Insitu ScanEagle unmanned aircraft system (UAS). 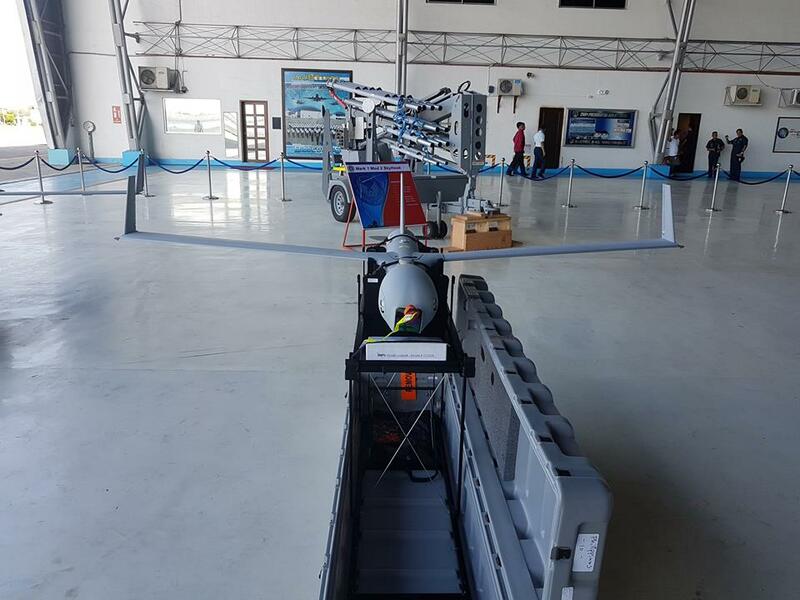 The contract notification award issued by the Naval Air Systems Command (NAVAIR) on 6 June covers a follow-on requirement for an undisclosed number of ScanEagle systems for the Philippines government. The country previously had not been known to field the type. The ScanEagle aircraft is 1.2 m long, has a wingspan of 3 m, and is launched using a pneumatic catapult. It has a service ceiling of 10,000 ft and an endurance of more than 20 hours. The ScanEagle is equipped with electro-optic, infrared, and high-resolution video cameras that enable the operator to track stationary and moving targets. If this is issued by NAVAIR, it is probably purchased thru FMS. 1. True story, but not announced. 2. Fake edit by an eager beaver. Based on the Navair release, it's a "follow-on" order. Which always means that the buyer already has it and wants more. Based on the press conferences of the AFP, they have admitted that the drones flying over Marawi are all ours. Shoulder taps from PAF sources pointed to personnel headed to training in Bingen WA as early as Q4-16, but we kept that under wraps. There's nothing up there but Insitu. This wasn't the first class either, so the operation isn't brand new, but it isn't years old either. Based on the case number nomenclature, PI = Country (Philippines), P = Implementing Agency (US Navy), LBA = Unique code for item. 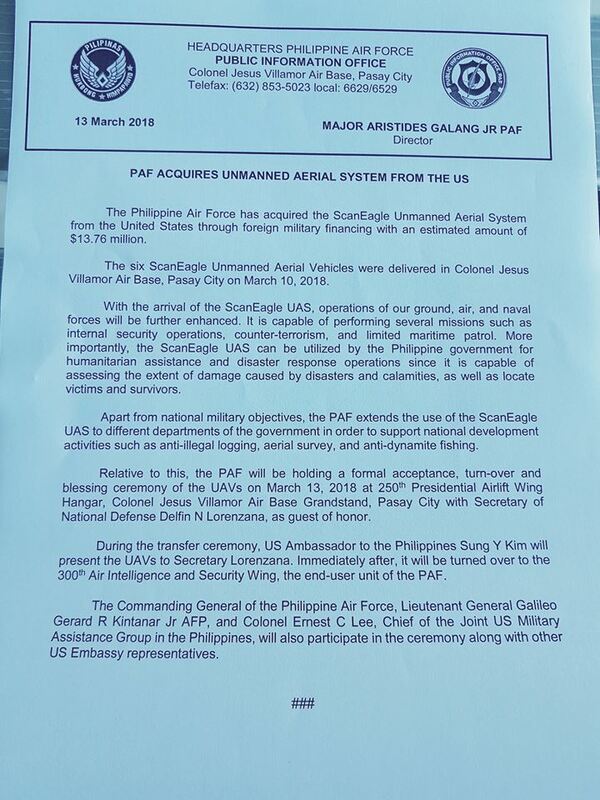 TF Archipelago/ JSOTF-P were using the ScanEagles in the Philippines before and probably still are. Insitu is set to supply the Philippines with six ScanEagle UAS following a contract announcement on 15 August. The US Department of Defence (DoD) awarded a $7.4 million contract to the unmanned systems manufacturer, the contracting activity is the US Naval Air Systems Command. Insitu Inc., Bingen, Washington, is being awarded $7,407,625 for firm-fixed-price order N00019F0235 against a previously issued basic ordering agreement (N00019-17-G-0001) for the procurement of six ScanEagle unmanned aircraft systems, related support equipment, training, site activation, technical services, and data for the government of the Philippines. Work will be performed in Bingen, Washington, (70 percent); and Hood River, Oregon (30 percent), and is expected to be completed in July 2019. Foreign military sales funds in the amount of $7,407,625 are being obligated at the time of the award, none of which will expire at the end of the current fiscal year. Looks like the contract may have been tweaked a bit. Insitu Inc., Bingen, Washington, is being awarded $9,975,624 for firm-fixed-price order N0001917F1568 against a previously issued basic ordering agreement (N00019-17-G-0001) for the procurement of six ScanEagle unmanned aircraft systems, related support equipment and spares, training, site activation, technical services, and data for the government of the Philippines. Work will be performed in Bingen, Washington (75 percent); Hood River, Oregon (10 percent); and the Nueva Ecija, Philippines (15 percent), and is expected to be completed in September 2019. Foreign military sales funds in the amount of $9,975,624 are being obligated at the time of the award, all of which will expire at the end of the current fiscal year. The Naval Air Systems Command, Patuxent River, Maryland, is the contracting activity. Interesting tidbit in Jane's about ScanEagle evaluations that the Australians are doing. After executing a number of successful missions from an Adelaide (Oliver Hazard Perry)-class guided-missile frigate in the Middle East, the Royal Australian Navy (RAN) has completed operational evaluation (OPEVAL) of the ScanEagle unmanned aircraft system (UAS). The OPEVAL was completed onboard HMAS Newcastle , which is currently deployed as part of Operation ‘Manitou’ – Australia’s contribution to an international effort promoting maritime security in the Middle East. Newcastle has been equipped with four ScanEagle vehicles for the evaluations. 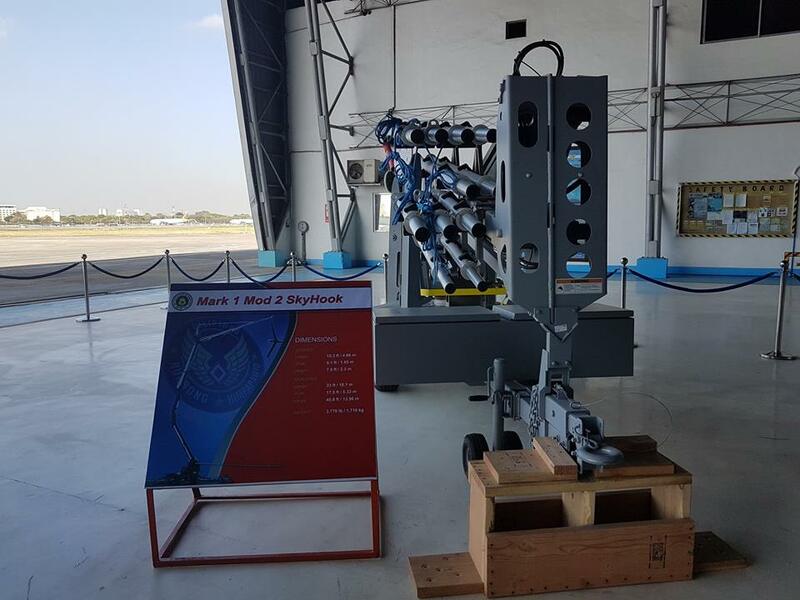 LOOK: The six Scan Eagle unmanned Aerial vehicles delivered today at Villamor Airbase. 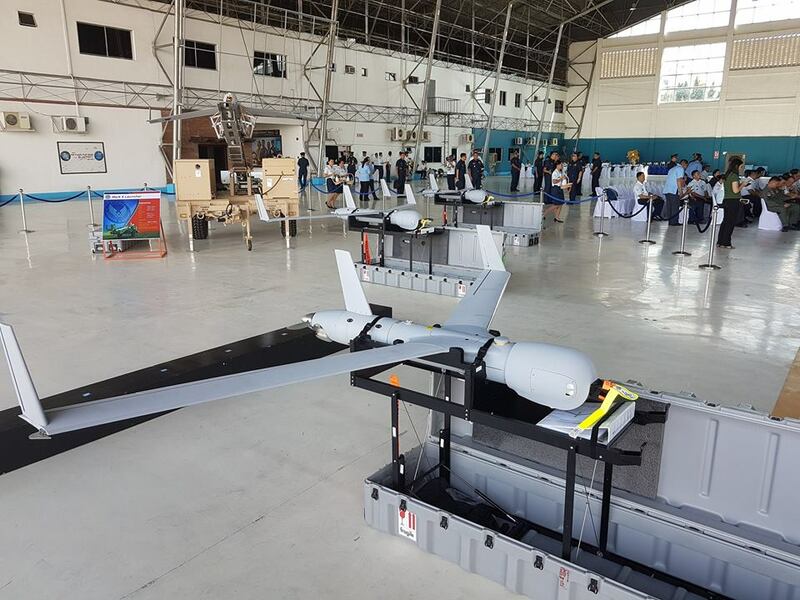 The Philippine air force has acquired the Scan Eagle Unmanned Aerial system from the United states through foreign military financing with an estimated amount of $13.76 million. It is capable of performing several missions such as internal security operations, counter terrorism, and limited maritime patrol missions. Now that I think about it, they might also be the unit tasked with operating the planned Elbit Hermes drones as well, wouldn't they? "Lt. Gen. Steven Kwast said at the Air Force Association's winter conference the service doesn't have to settle for a personnel-to-aircraft ratio about seven times greater than manned aircraft require, and needs to find a way to manage those..."
UAVs saves lives but does not save on personnel costs.